Various pg & vg mixes in selectable variations, factory bottled in Greensound, Hangsen and Dekang brands. 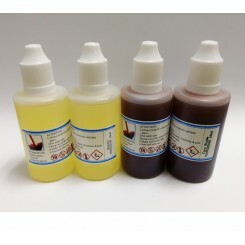 The genuine dekang e-liquid vegetable glycol e-jiuce with SGS PG & VG MIX 20ml x 5pcs in one flavor. If you want "other flavors" please leave a message when you checkout. The genuine dekang e-liquid pg&vg e-jiuce with SGS 10ml x 5pcs in one flavor. If you want "other flavors" please leave a message when you checkout. PG VG DEKANG 30 ML e-juice liquid 30ml x 5pcs in one flavors. the best taste for you If you want "other flavors" please leave a message when you checkout. The Original dekang e-juice liquid 50ml x 5pcs in one flavor. The best!!! If you want "other flavors" please leave a message when you checkout.